Revitalise dull, lifeless locks with the S-Factor Stunning Volume Conditioner from TIGI. 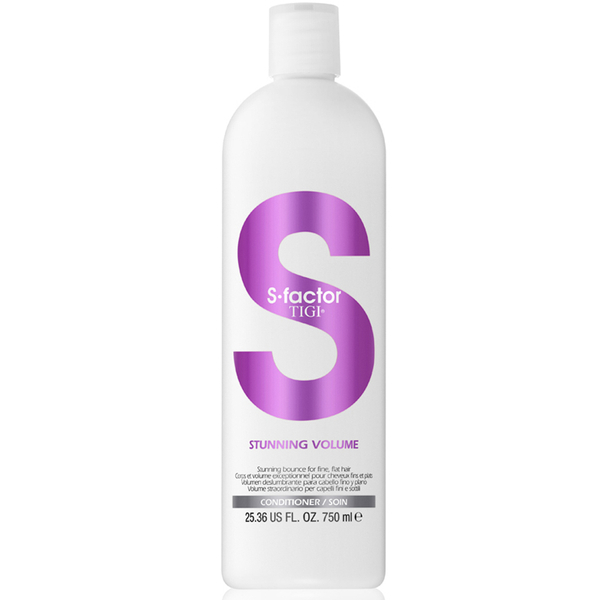 Packed with Nettle, Jojoba Oil and Pro-Vitamin B5, its innovative formula delivers long-lasting hydration, enhances definition and boosts volume from the root to leave you with full-bodied, salon-style hair. Tames flyaways and imparts luminous shine so you can experience thicker, fuller tresses with revived radiance. E.N. Work thoroughly into hair after using shampoo. Rinse well. Conditioner: Water (Aqua/Eau), Cetearyl Alcohol, Stearamidopropyl Dimethylamine, Behentrimonium Chloride, Fragrance (Parfum), Glycerin, Dimethicone, Phenoxyethanol, Lactic Acid, Dipropylene Glycol, Panthenol, Hydroxypropyl Methylcellulose, Polyurethane-39, Potassium Chloride, PEG-45M, Disodium EDTA, Amodimethicone, Magnesium Nitrate, Cetrimonium Chloride, PEG-7 Propylheptyl Ether, Citric Acid, Silica, Benzoic Acid, Simmondsia Chinensis (Jojoba) Seed Oil, Propylene Glycol, Dehydroacetic Acid, Methylchloroisothiazolinone, Magnesium Chloride, Methylisothiazolinone, Ethylhexylglycerin, Honey (Mel/Miel), BHT, Rosmarinus Officinalis (Rosemary) Leaf Extract, Urtica Dioica (Nettle) Extract, Amyl Cinnamal, Hexyl Cinnamal, Limonene, Linalool.